Use our new fleet of Tankara fly fishing rods to test your luck at Japanese style Tenkara fly fishing. Japanese Tankara fishing is the best way to learn the basics of fly fishing and catch some fish without the constant frustration of tangles. We typically use the Tenkara rods when fishing for blue gills, as you are almost (almost…) guaranteed to catch a fish. 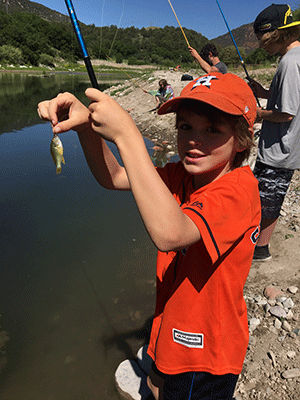 Some campers have caught ~40 fish each in an afternoon. If you get really good at Tenkara fishing and want to try your luck catching some trout, we will be psyched to take you up Independence Pass to some of the high alpine waters.